This Friday Angels & Demons debuts -- a film based on author Dan Brown's book by the same name. Brown is also the author of The DaVinci Code -- a book and movie which continue to create controversy. 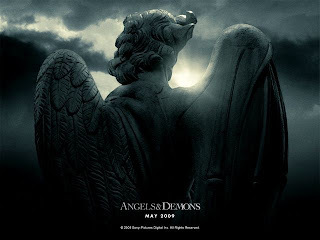 Angels & Demons is technically the prequal to The DaVinci Code. Robert Langdon, the protagonist, is called upon to shed light on a mysterious and grotesque murder and ends up in the middle of an international incident. With his leggy side-kick, Vittoria Vetra, he races through the streets of Rome, unraveling a centuries-old riddle and following the Path of Illumination which has been hidden in plain sight for nearly six hundred years. To coincide with the release of the movie, Roaring Forties Press is publishing Rome's Angels & Demons: an Insider's Guide written by... Moi! My good friend, Miss Expatria, is a contributing photographer, too! And the best part: it is absolutely free! Yep. It's a free ebook, and it will be available to download on Friday. All this week I'll be giving you a sneak peek into the book, too. So, if you haven't read Angels & Demons, you have just 6 days to devour it. And don't forget to come back on Friday to download Rome's Angels & Demons: an Insider's Guide. You, too, can follow the Path of Illumination through the Eternal City. Looking forward to seeing the ebook. Congrats. Congratulations! I can't wait to see both your ebook and the movie! Very exciting!